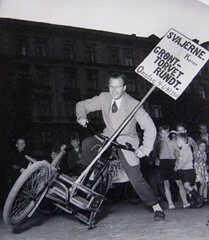 We're counting the days to this year's Svajerløb 2011 - Danish Cargo Bike Championships. We've got a brand new poster from the sure, graphic hand of Rich Melcher in San Diego and we're busy getting everything ready. It's gonna be good. We have many visitors from abroad making the trip to take part, which is brilliant. Including this brave soul who held his own Solidarity Race in Arizona last year. This year's race will take place at Carlsberg - the brewery giant. Visit Carlsberg are sponsoring the races and we'll be pedalling around the legendary brewery grounds in the Vesterbro neighbourhood. There are flat, fast stretches, cobblestone stretches and a couple of hills. Carlsberg is named after the founder, Carl Jacobsen, and Carl's Bjerg means Carl's Mountain/Hill. In short, this year's race is harder and more intense than the previous ones. We're thrilled that the City of Copenhagen's new mayor in charge of the traffic and environment department, Ayfer Baykal, will be on hand to fire the starting pistol to launch this year's race. The Svajerløb is a historical race that took place for decades last century. It wasn't a Danish championship, but rather a battle for bragging rights among the city's bike messengers on their longjohns and delivery bikes. It was a popular spectator event, too. The last race was in 1960, when car culture started to dominate goods transport in Copenhagen. The race was revived in 2009 by Larry vs Harry and Firmacyklen.dk and since 2010 Copenhagenize Consulting has been involved with arranging the races and the communications. This year we've teamed up with Rekommenderet.dk, too. There is a Danish championship for two-wheelers, three-wheelers and a team relay. We've added an Old Boys category for vintage cargo bikes and there will be a mini-svajerløb for small kids, too. 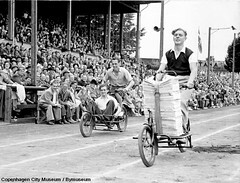 According to tradition, participants ride one lap empty and then stop to load car tires, newspaper bundles and a 'secret' cargo, whereafter they ride two laps fully-loaded. This year a number of cargo bike companies will on hand to display their bikes and we're aiming to get loads of spectators - families (25% of families in Copenhagen with two or more kids have a cargo bike), as well as cycling fans and journalists. This year's race is the kick-off event for an entire week of cycling activities. The World Championships in Road Racing will be held in Copenhagen from the 19th September and the entire city centre will be closed off to cars for over ten days. There will be no way to get around except for bicycles and public transport. It'll be brilliant. Over 200,000 tourists are excpected in the city for the event. The City of Copenhagen has a long list of events planned and you can see them on their website Festdage i cykelbyen - or Celebration Days in the City of Cyclists. The website for the Svajerløb - Danish Cargo Bike Championships is now accepting registrations. It costs 50 kroner (10 bucks) per race to participate. The mini-svajerløb is free. Pre-registration is a must. Pay on the day when you sign in. We have also added an option for people to challenge a friend to a personal duel. It's in Danish, but an email will be sent to him/her challenging them. Here's the Facebook group page and remember to tell us if you're coming on the Facebook Event Page.